Polis, 2006, paper, tape, and frame, 8 1/4 x 11 13/16". This month, Masa (Table), a traveling glass-topped cabinet for commissioned art projects, has planted its legs at BAS, a space where artists’ books and prints are both produced and displayed. Responding to the vitrine as a site for scientific collections, Paris-based artist Isabel Schmiga presents Bandits, 2008, an assemblage of twenty delicate, insectlike paper models. Displayed in militaristic rows, each one cleanly pinned, both the mechanical imagery printed on their backs and the attendant labels hint at their arthropod genesis. Schmiga has often employed books from the “Observer’s” series as both guide and literal material. To make Bandits, she used The Observer's Book of Aeroplanes, cutting out the aerial technical view of the aircraft and assembling the parts into three dimensions. The resultant models reorient the original drawings’ references from man-made to natural, from macro to micro, proposing a novel evolutionary narrative. Schmiga is fascinated by an object or idea’s potential to change state, whether literally or figuratively. 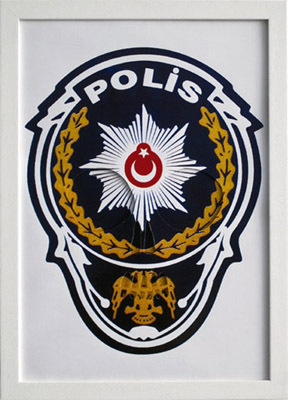 Her other work on display is Polis, 2006, a series of repeated photographs of the Turkish Police badge snugly lined up against one another across the wall. Schmiga became obsessed by this authoritarian ornament after spending several months living opposite a policeman. The artist draws attention to the badge’s eerie skull-like shape: The double eagle insignia forms a mouth, the crescent moon and star motif an ominous third eye. Each of the prints in Polis layers a carved relief that subtly highlights the emblem’s skull-like features atop the original photograph. As in Hans Holbein's The Ambassadors, 1533, the representation is rendered in anamorphic perspective and only becomes clear when viewed from certain angles. In this camouflaged state, the badge, like the police it adorns, amalgamates an aura of protection with an implication of fear.